The Skylab 3 crew, assigned to the second manned mission to the Skylab station. 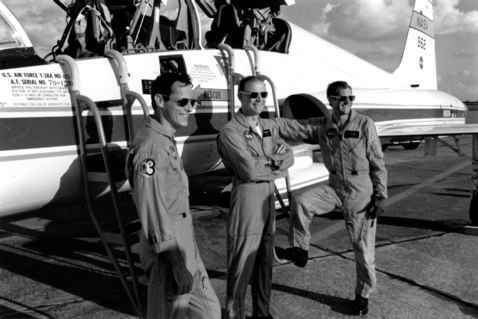 Left to right: Science Pilot Owen Garriott, Pilot Jack Lousma and Commander Al Bean. 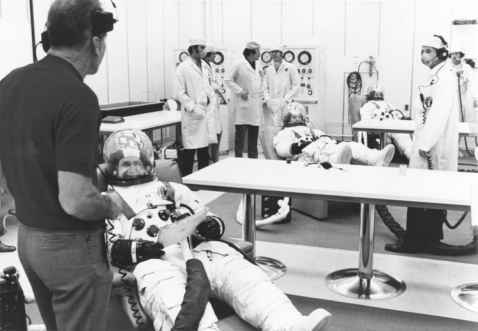 The Skylab 3 crew in the 1-G Skylab trainer review their procedures. Left to right: Garriott, Bean, Lousma. provided the layman with an understanding of flying in space. Along with Jack Lousma's "space fan'' broadcasts on life in space, this gave Skylab inexpensive publicity and a lighter approach than the shorter, but more dramatic flights to the Moon. Skylab may have been perceived as a "routine" programme in space, but in some respects it was far more important to the long-term exploration of the solar system than the Apollo missions, though this was not necessarily apparent to the watching public. 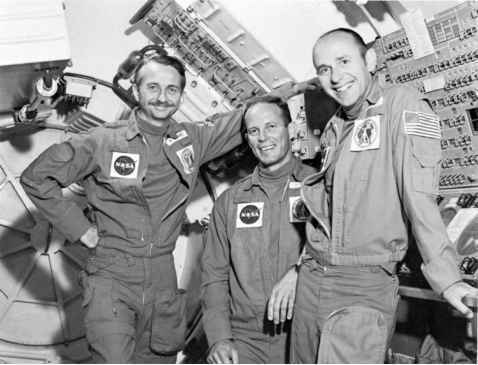 Garriott also recalled the sheer fun of "running" around the ring of lockers, first demonstrated by the Skylab 2 crew. Al Bean was a competent gymnast, but it was not long before all three members of the second crew were flipping and twisting across the domed upper workshop. "I'm sure you could win all the gold medals on Earth if you were just allowed to compete from space,'' was Garriott's opinion. Director of Flight Crew Operations Deke Slayton talks to Skylab 3 commander Al Bean during suiting operations prior to launch. Lousma and Garriott can be seen at rear. examine the corona and mass ejections, data that was still being used for comparison with unmanned spacecraft data twenty-five years later. The other highlight was the focus on adaptation to long-duration space flight, proving that it is not a handicap if an emphasis is placed on the importance of exercise. This had direct application to extended duration flights on the Shuttle and ISS and will apply particularly on prolonged flights out to Mars. Ed Gibson likes to describe his only space flight, of eighty-four days, as over 2,000 hours of high performance rocket time - although he slept though a third of it.20 Having worked on AAP/Skylab issues since returning from flight school, Gibson became the point of contact in the Astronaut Office for the development of the ATM on Skylab, along with Garriott. 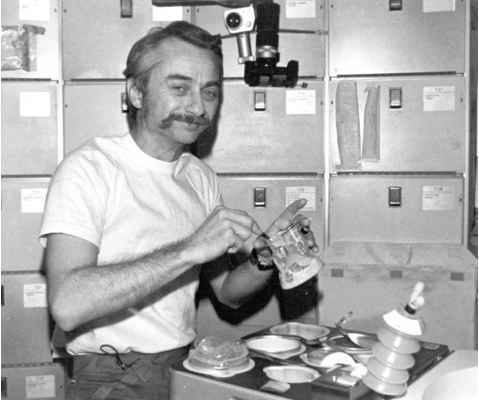 SL-3 Science pilot Owen Garriott enjoys a meal in the wardroom of Skylab during his 59-day mission. two missions. Gibson recalled that the third crew worked all their days off and stayed up late as much as the second crew had. 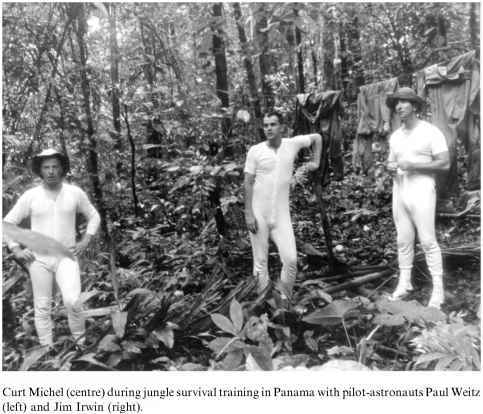 Eventually, though they struggled early in the mission, they would return with a quantity and quality of work comparable to that of the other two crews, due in part to learning from their colleagues' experiences. 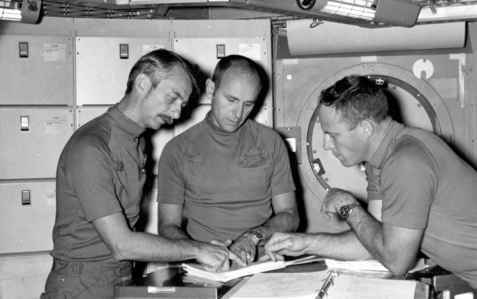 Gibson speculated that if the second and third crews had flown in reverse order, then Bean's crew would have come out with the higher quality data, simply due to the learning curve of the "system" based on the previous missions. 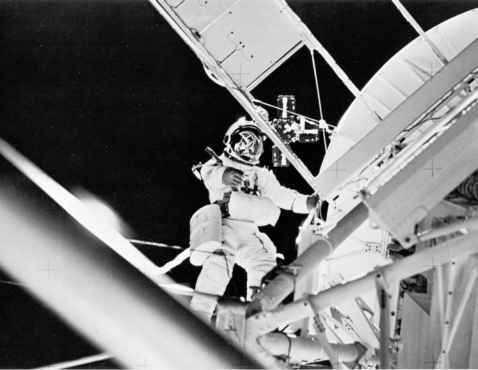 Owen Garriott on EVA from Skylab during the second manned mission. The Skylab 4 crew arrive at KSC in their T-38s ahead of final preparations for the last mission to the Skylab space station. Left to right: Gibson, Carr and Pogue. acclimatise to space flight and find where everything was stored. There were no open communications to help them and they fell even further behind, until things reached a point when they voiced their opinions to the ground, and the ground responded by expressing their concerns to the crew. Following this frank exchange, the mission finally began to gather pace. By the end of the flight, the crew was surpassing many of the records set by the previous occupants. Gibson considers Skylab 4 to have been a mission at the forefront of something which was going to grow and become much larger in the future. ''The enjoyment was in looking back at Earth, the EVAs and some of the good science that was done and being able to use human ingenuity to accomplish it. Not to be just a button pusher, but to exert some human judgement into how you operate the experiments and then improve the quality of what was brought back. I realise how lucky I was to be in the right spot at the right time.'' One thing he would readily like to forget was the huge amount of food bars stuffed into the Command Module to supplement the food supplies on the space station. After three months of eating them, he has never been able stomach one since. 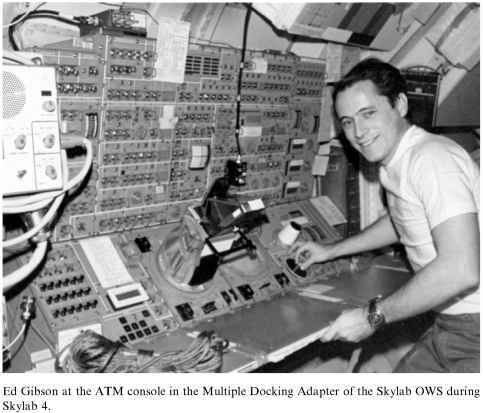 Ed Gibson at the ATM console in the Multiple Docking Adapter of the Skylab OWS during Skylab 4.